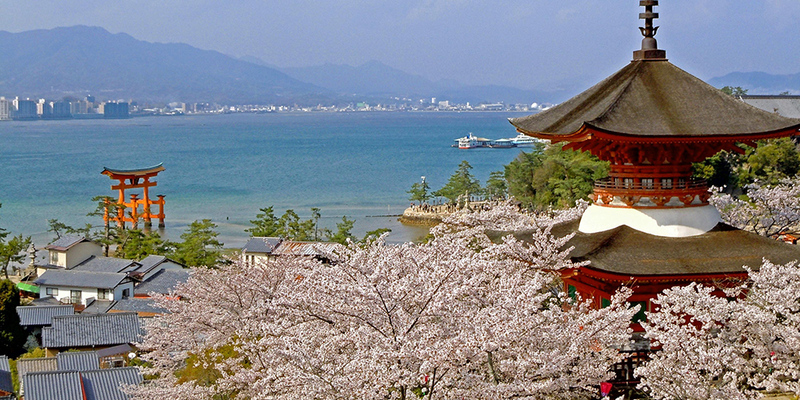 The World Cultural Heritage Itsukushima Shrine is rare in the world for its wooden structure that seems to float on the sea as the tides shift. 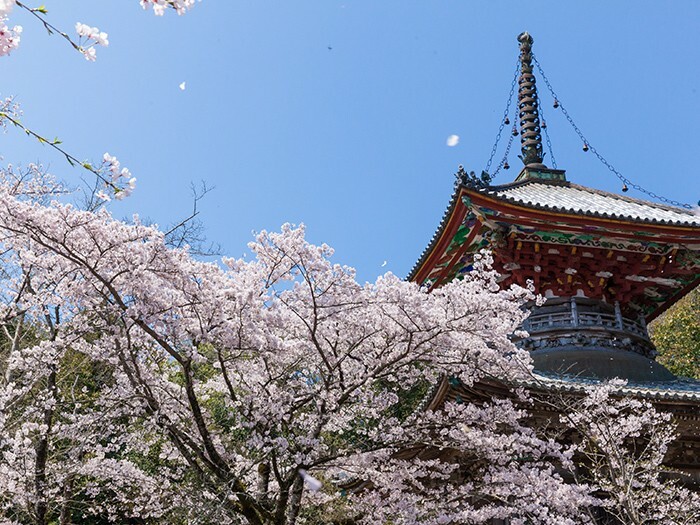 The shrine was built with funds from Taira no Kiyomori, a prosperous warlord in the Heian Era. Its majestic and splendid main building (shaden) incorporates features of the palatial style of architecture favored by aristocrats in the Heian Era. At full tide, the shaden magically looks as if it is floating on the sea. 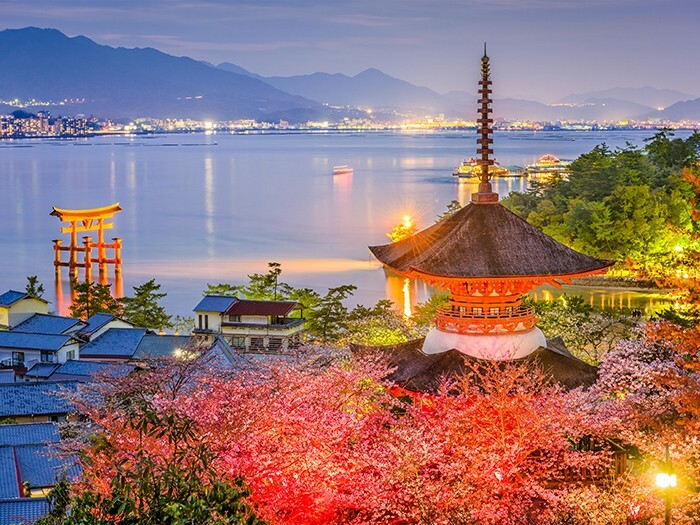 Miyajima Island also has around 1,900 cherry blossom trees, and when standing near the Tahoto (two-storied pagoda) on the west side of the shrine, you can enjoy a magnificent view of the large Torii gate that appears to be floating on the sea framed by cherry blossoms. 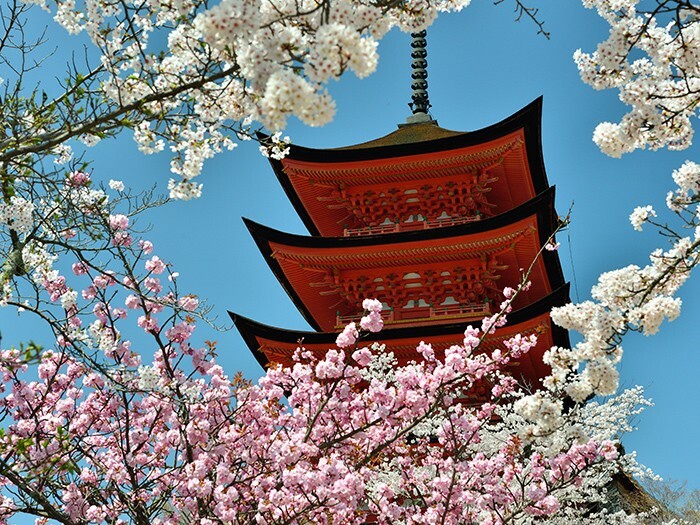 You can also enjoy the elegant scenery of the island’s five-storied pagoda accented by cherry blossoms. 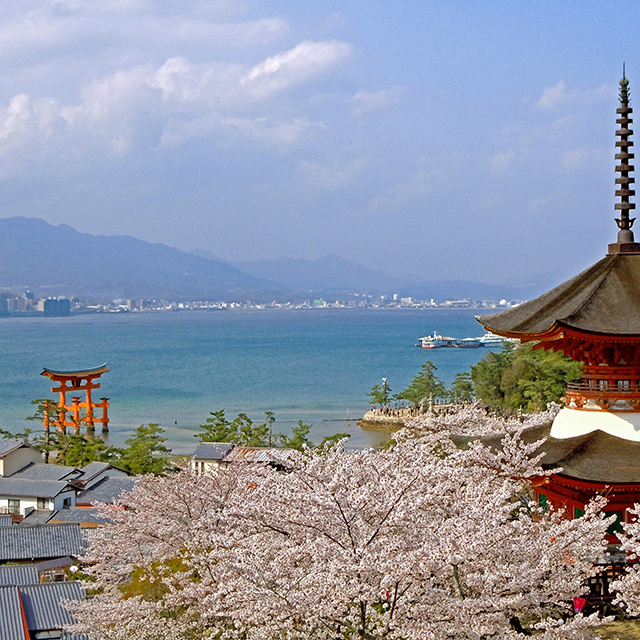 Parking is only available around the Miyajima-guchi Sanbashi area. 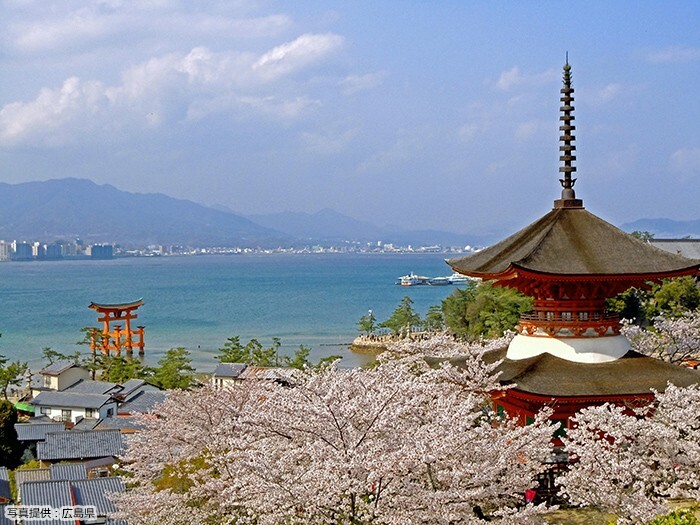 From JR Miyajima-Guchi Station, walk for around 5 minutes to Miyajima-Guchi Sanbashi, and take the JR West Miyajima Ferry (connecting ferry) or Miyajma Matsudai Kisen ferry for 10 minutes to Miyajima Sanbashi, then walk for around 10 minutes. 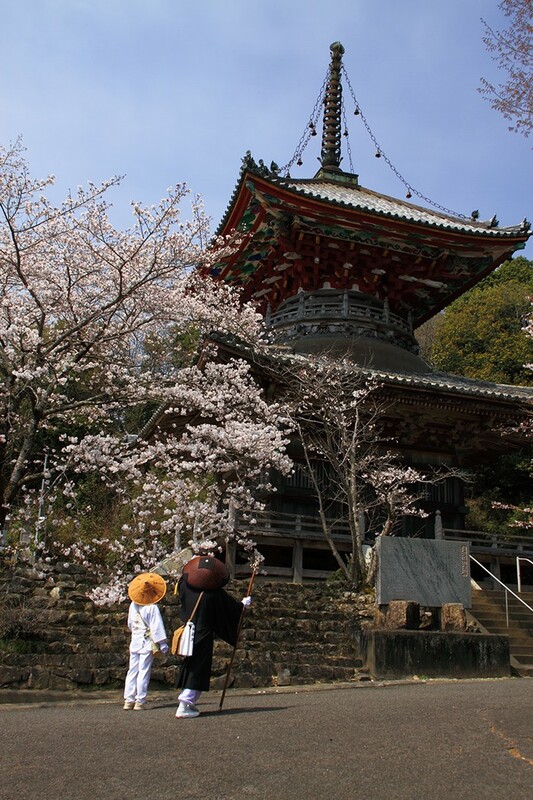 The Shikoku 88 Temple Pilgrimage is popular even among foreign tourists these days. It was started by the Japanese Buddhist monk Kobo Daishi (Kukai), who founded the Shingon school of Buddhism, as a journey to visit the sacred grounds of the island. 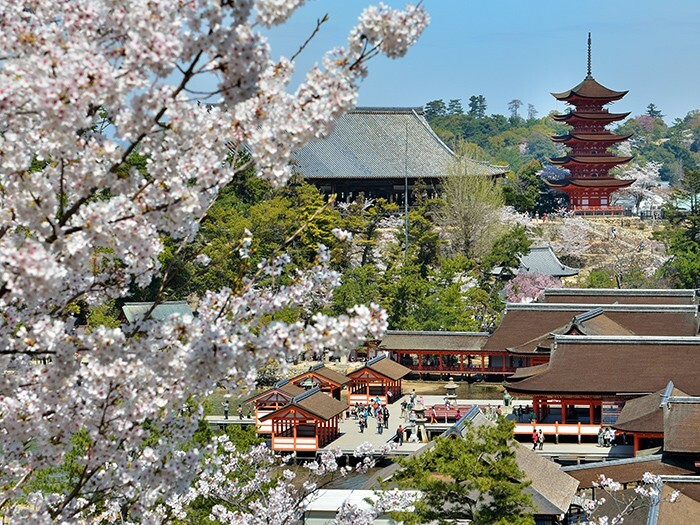 As the eighth temple on the pilgrimage, Kumadani-ji strikes a splendid view with its vermilion tahoto (two-storied pagoda) accented by soft pink cherry blossoms. It also has the grandest temple gate of all the temples on Shikoku’s pilgrimage route. 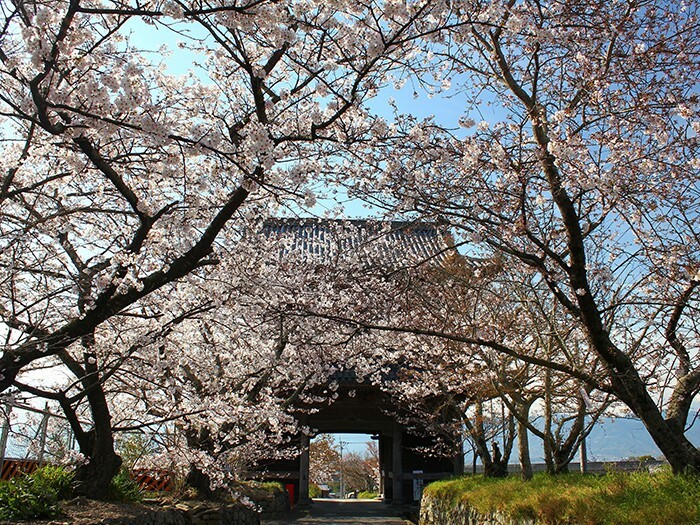 During cherry blossom season, the gate is adorned by the light red petals of the rare Hachisuka-Zakura blossoms. It is a truly elegant scenery that enthrals all who see it.